Now that we’re back and we have had a chance to reflect on our journey, we have written a follow-up post to the Interview questions that we published in April. What were your top five destinations and why? India, particularly Rajasthan: India has an amazingly colorful culture. Every person on the streets could be a National Geographic cover. In Rajasthan, the desert is golden, the buildings are stucco or clay, but the people love color so they wrap themselves in vibrant hues – even the men wear bright red or fuschia turbans – and adorn their homes with flowers and colorful tiles. The food is sensational. The people are friendly. The architecture, history, religious dynamic and volatility are fascinating. India is the dirtiest place I have ever experienced but I am utterly enthralled by it. Japan: It wasn’t even on our initial list of places that we wanted to visit. We only went because we had friends from the States who were living there at the time and we wanted to visit them. From the day of our arrival to the day we left, two weeks later, I was bowled over by Japan. The gardens and architecture were especially impressive. I never tired of wandering through public parks and private gardens with their enchanting pagodas and twisted trees. Everything was pristinely manicured and seemed somehow perfectly placed to inspire an overall feeling of peace and well-being. Japan was full of unique and fascinating experiences: visiting the Atomic Bomb Museum in Hiroshima, dressing up as a geisha in Kyoto, feeding deer in Nara, dining on Kobe beef in Kobe, our beautiful stay at the ryokan in Tsumago/Magome, visiting the Jensens in Tokyo, and, of course, the cherry blossoms. Japan was one of the places in which we struggled most with the language barrier but every experience was dazzling and unforgettable. It was one of the true gems of our trip. New Zealand: What’s not to love? New Zealand is one of the most beautiful places on Earth! For outdoor lovers like us, there are so many things to see and do. Queenstown was one of the coolest cities on our itinerary with stunning scenery and a ski town vibe. We spent the majority of our time on the South Island, reveling in some of the most breathtaking places imaginable. We sampled the delights of the Marlborough wine region and embarked on a host of outdoor activities like hiking the Routeburn Track, kayaking in Abel Tasman National Park, boating on Milford Sound. The North Island, though slightly less aesthetically pleasing than the South, was still spectacular. Our day of sailing in the Bay of Islands was one of our best days on the road and, if we ever do another trip around the world, it will be on a sailboat, inspired by that day. New Zealand is easy travel for Americans because everyone speaks English and the culture is similar yet uniquely interesting. It is a long way to get there but most definitely worth the trip. France and Italy: It seems like a cliché to put France or Italy on this list but it must be done. The two are simply dazzling. No matter how much they have been built up in your mind before you go, you are still floored by the beauty of their art and architecture and by their cuisine and outdoor café culture. I had a wonderful Humanities class at U of A that exposed me to the world of European art. I have since been fascinated by it so the churches and museums in France and Italy were among the most significant sights on my wish list. The Louvre and the Vatican greatly exceeded my highest expectations and I would return a hundred times over, just to spend more time there. The Italian coastal towns of Amalfi, Positano, Atrani and Cinque Terre are among the most beautiful places in the world. Also, the wine regions of Bordeaux, St. Emilion and Tuscany were absolutely breathtaking. Bordeaux came with a little too much French attitude but I did love every wine that we tasted and there is a magic about St. Emilion that you must experience to fully understand. We also loved finding spectacular local wines in both France and Italy for 2-3 Euros a bottle. Runners Up: Bali, Belgium, Zanzibar, South Africa, Australia, Thailand…not necessarily in that order. 1. India – It was one of the most interesting and colorful places that I’ve ever seen. 2. 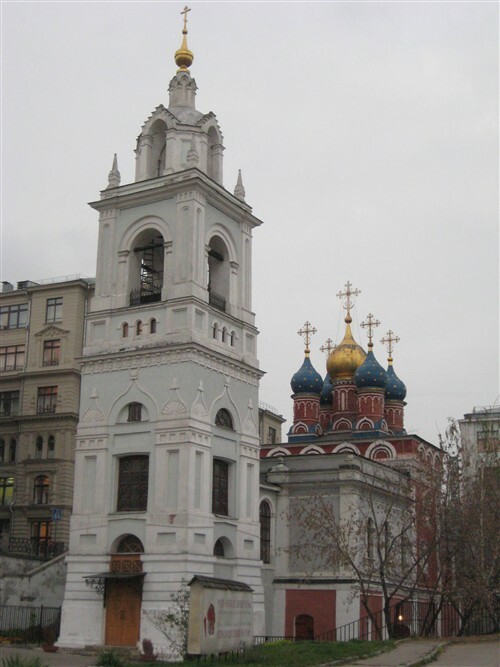 Russia – Beautiful churches and warm, friendly people. This was the most difficult place for us to travel, from visas to language barriers, and it remains one of the most mysterious countries on earth, but I loved it. 3. Japan – There is so much history and culture here that contrasts with the first world, consumer-driven society. 4. France – World-famous museums, wines, and cheeses…and a patisserie on every street! 5. New Zealand, South Island – One of the most physically beautiful places on earth. What was your least favorite destination and why? Mozambique: the diving was disappointing and the accommodation was pretty awful but the beaches were beautiful and the people were kind. Our greatest difficulties in Mozambique were our hyper-sensitivity to the sun – a side effect of our malaria pills; rain leaking through the roof of our hut onto our bed; cold water showers; and rats that ran through our hut each night. China: I had a serious mental block about China and I don’t know why – the sights and accommodation were excellent. The language barrier was at times exhausting. The public smoking was atrocious. And there were SO MANY PEOPLE!!! In China, I felt like I was almost constantly in a crowded elevator, inhaling other people’s breath and secondhand smoke. Lamu (an island off the coast of Kenya): What was intended as a “vacation from our vacation” turned out to be a real disaster in almost every way: awful accommodation; food poisoning and mosquitoes for Aaron; no services on the beach; and our misadventure with the Now Legendary Captain Barracuda. The saving grace was that we got to hang out with our friend Marie again. The fresh mango juice was absolutely divine but Aaron would NOT recommend the fish! Nepal. We were there in the middle of the off season and there wasn’t much to do. We couldn’t see the world famous mountains because the visibility wasn’t good and it was too hot and humid to explore much outside of the cities. Added to that, we were simply waiting to find out if Tina’s medical condition would improve. It probably had more to do with our mental attitudes at the time than the place itself, but it seemed like the longest three weeks of my life. Describe the most physically difficult experience? The first day of the mountain trek in Chiang Mai in northern Thailand – the longest and steepest uphill climb of my life! It hurts just thinking about it. We arrived at the train station in Suzhou, China in the middle of a rainstorm. We overpaid a gypsy taxi that dropped us off in the wrong part of town. Then we trudged around with our bags in the pouring rain. After several attempts we finally flagged down a rickshaw driver who would take us to the right hostel, we rode in the mostly uncovered backseat for another twenty minutes getting completely soaked. When we finally arrived at the hostel, the driver tried to extort us for more money – and Tina nearly killed the guy. We were cold, wet and both in a bad mood. It was miserable. Name one thing that you’ve learned about yourself. I love my country! I am so much more patriotic than ever before. We live in the best country on Earth and there is nowhere else I’d rather be in the long term; no other citizenship I would rather have. Strangely, I thought that the trip would have the opposite effect on me because Europe is so glamorized by Americans and you always hear about how Americans are perceived negatively abroad. In many countries, we are perceived negatively. However, if you gave most of those same people the opportunity to come and live here, they would be on the boat faster than you could say “United States of America”. While I’ve discovered how to be a little more patient and less antsy, I still can’t sit still for long. And I still get annoyed when I have to wait…and I’m not good at hiding my impatience. My dog, my bathroom, and salad. Lena, our little furry child substitute. No matter how long we were away, we thought about her at least once a day and often much more than that. It didn’t really feel like we were home until we had spent about a week with our little dog and she knew that we were here to stay. The ability to get any consumable that I want at anytime. There were a number of times during our travels when we had tremendous difficulty finding simple everyday items like deodorant and toothpaste. I’ll never take Walmart for granted again! What was one of your favorite activities? Watching the Tour de France! We woke up early and waited for hours along the Champs Elysees for the final stage of the Tour. When the riders finally came around for their first of eight laps, it was totally worth it. After sitting and standing on the concrete curb for nearly eight hours, we stood for another hour on our aching feet to watch all eight laps. My mom and Tina were both there and were so patient – I’ll never forget that day! What did you enjoy most about life on the road? The simplicity of living out of a backpack. There is something organic and reassuring in the realization that all the material possessions you really need can be carried on your back. It is quite a shocking experience to live like that for over a year and then come home to examples of American excesses around every corner…your own storage space included. Aaron’s jaw dropped when he found a crate of his sweaters…just sweaters – a whole box of them! It is amazing to think about how much more we have than we really need and funny/sad that we always seem to be trying to get more and more and more. Unfortunately, these things often distract from what is truly important. The simplicity of living out of a backpack. Everything you own is on your back. If you buy something, you have to carry it. It really made me analyze every purchase decision. And there was rarely any indecision about what clothes I would wear on a given day – whichever shirt or pair of pants was cleanest. What did you enjoy least about life on the road? The bathroom situation. I’ve been candid in my blog posts about my “germophobic” tendencies and our varied and often shocking bathroom experiences around the world. For some people, where and how they attend to this necessary human function is not a big part of their day. Well, for me, it is a HUGE part! In fact, some of our days seemed to actually revolve around it. Every country was a little different and it was ALWAYS more difficult for women. For example, I remember a day in Rishikesh, India when we were out walking around town. I had to go and there was literally nowhere that I could go. India is a place where men pee anywhere and everywhere, like dogs marking their territory. I saw more men urinating in public in India than I can count on both hands and both feet. Probably more than twice that many. That day in Rishikesh, when I thought my bladder was going to burst, I could not even find a private spot in a field. We had to walk all the way back to our hotel. In many countries in Europe, businesses charge to use the restroom, even if you are a patron. In all countries, it is mandatory to carry your own toilet paper. And then there were the squat toilets, though I believe I’ve covered that topic sufficiently already. Let’s just say that I’m VERY happy to be home! The shared bathrooms and small showers. We often joked that hostels are like a box of chocolates because you never know what you’re gonna get. But it’s true. More often than not we shared a bathroom with at least one or two other people – and there are some seriously messy people in this world! And the showers – I can’t even remember how many times we showered in a bathroom where there wasn’t even a bathtub or curtain or “shower”. There was just a shower head poking out of the wall next to the toilet and a drain in the middle of the bathroom. Very interesting. If you could re-locate now to one city that you’ve visited thus far, which would you choose? This is the hardest question. There were so many cities in which I would love to live temporarily. My ideal city has all of the following: mild climate, mountains, beach, European café culture, beautiful architecture, and world class museums. I have yet to find one city with all of these attributes. All that aside, I could live in Paris for a while, just to be close to the Louvre. Sydney, Australia. It’s beautiful. Aussies are fun-loving people who enjoy spending time outdoors. And culturally it is very similar to America. We would get along just fine. Name the top three international destinations still on your “wish list”? Argentina – I am sad to have missed South America. It is not as painful for Aaron because he has already seen much of it. He has me sold on Buenos Aires and we like the idea of learning Spanish and teaching English. What advice would you give to someone trying to plan a similar trip? Plan as you go. It’s not much more expensive than the round-the-world ticket and you have the freedom to change your itinerary as often as you like. You quickly realize on a trip like this that it is better to see less places and stay longer in each place. If you have the choice, don’t wait until retirement. The reasons are many-fold: 1) World travel is physically intensive. As an average retiree, you are less physically fit and have more health considerations, which can greatly limit your range of activities and experiences. 2) You could die before you get there, instead leaving all of your hard-earned travel money to children who will squander it on trivial things. Easy come, easy go. 3) An experience like this opens your eyes in many ways. Life after traveling the world is financially poorer but spiritually richer. 2. Budget more than you think you’ll need – currency exchange rates are totally unpredictable and will break any budget. 3. Pack light. Everything that you REALLY need, you can find just about anywhere in the world. How do you feel the trip has changed you as a person? I feel like a more compassionate and patient person. I care about being a better global citizen – working to be a little greener and paying attention to what’s going on both inside and outside our borders. The most significant change that I’ve noticed in myself, however, is an insatiable thirst for knowledge. I read voraciously and have always enjoyed literature but these days I find my reading list overtaken by nonfiction works on world history, religion and politics. While I will always be a lover of language and a sucker for a good story, my interests have broadened in fascinating directions. I’ve always been a self-confident person but this trip has really shown me that I am also competent and can handle adversity in my everyday life. It is very empowering to know that I can manage life’s challenges with a little critical thinking and ingenuity. I’ve also learned that it’s okay to ask for help. Whether you speak the language or not, if you ask, people will more often than not do their best to help you if they can. What did you take away from the experience of traveling the world that was unexpected? 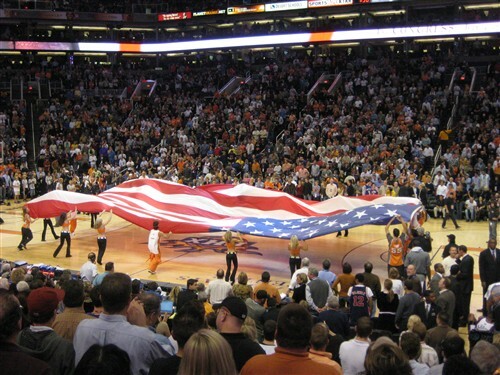 Now that we’re back, I’m much more patriotic. While I’ve always been proud to be an American, our experiences around the world reminded me that we still live in the greatest country on earth. Our freedoms, the quality of our food and services, and the courageous will of our people are unparalleled around the world. Name three things about America that you will no longer take for granted? American service – I’ll never bat an eye about leaving a generous tip for good service. In countries where gratuity is mandatory or minimal, service workers are simply less motivated to please the customer. If you send a dish back for inferior quality or your Coke is flat, in many countries, you’re still paying for it. American health care – Yes, our health care system is in need of reform but it is still the best in the world. American shopping – nowhere else in the world do you get the same variety of products from which to choose…and I mean NOT EVEN CLOSE!!! 1. Freedom. We are the most fortunate population in the world. We live under a system of government where we freely and democratically elect our officials; we can speak our minds in any medium, and do just about anything that we want within the rule of law. 2. Shopping. America is the land of consumerism. We seem to have a greater variety of things that we can buy at Costco than Russians have in their entire country! It’s unbelievable! 3. Great salads. Nowhere else that we traveled could we buy prepared salads (or even the ingredients for a lettuce salad) that even matched the quality of our salads in the US. I lost count of how many times we stopped at McDonald’s while we were traveling just so we could get some greens! How do you envision life after traveling the world? I want to start a family. The rest is just details. It’s back to a normal life with a job and day-to-day responsibilities. The long way home from Moscow was broken up into several legs both to ease the transition and make a couple of convenient stops along the way. 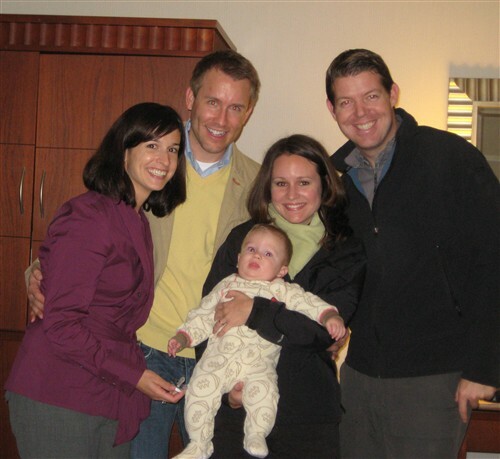 We re-entered the United States in Boston and made plans to spend one night in the city to meet little Maaden Rooney – pride and joy of dear friends, Mark and Meredith. At the Boston airport we collected our backpacks for almost the last time and stopped at the information desk to get directions to our hotel. The gentleman at the desk was friendly and helpful and we laughed at the wonderful ease of the English-language transaction. It was good to be home. With smiles plastered on our faces, we walked to the train stop and found our route. On the train, we listened in wonderment as each stop was announced in English. There was no need to count stops or decipher foreign characters. It was brilliant! Then, as we were changing trains, an altercation ensued nearby where, in between the cursing and Ebonics, threats of people getting shot echoed through the underground station. Whoa, reality check! Suddenly, the stars in my eyes were shrouded by a dark cloud as I was reminded that, while America is the greatest country on Earth, not everything is roses. Seeing Mark, Mer and Maaden was great. We spent about an hour fawning over the little superstar at the hotel and then went to dinner at a place nearby. The menu was excellent but all we wanted was salad – good old American salad with lots of lettuce and fresh ingredients. This, my favorite food, proved to be the most difficult dish to find on the road. Oh, salad is on a lot of menus around the world but often the main ingredient, instead of lettuce, is potatoes or beets or some distant relative of a recognizable vegetable that defeats the whole purpose of ordering a salad in the first place. Pardon the rant – it’s a sensitive subject. Our first American, non-McDonald’s salads were absolutely divine. It was good to be home. Early the next morning, we flew to Dallas, where we had purposely inserted an 8-hour layover on our way to Phoenix – our temporary final destination. At DFW Airport, we rented a car and drove to our storage unit where we filled two small roller boards with as many jeans, shoes, and sweaters as we could fit inside. We were there for about two hours, sifting through our possessions, smiling at things we forgot we owned, and dazzled by the breadth of our respective wardrobes. Next, we drove north to our old neighborhood in Keller to cast our vote in the 2008 Presidential Election. Texas is a die hard red state but, since we have been following the campaign from abroad and have visited so many places where, sadly, people do not have the right to vote or are terrorized into voting for corrupt rulers, we felt strongly that it was important to exercise our right to vote for the next leader of our country. We drove by our old house next to make sure the new owners were keeping the landscaping up to our standards and to reminisce about the life we left behind to pursue a dream. It was a beautiful house and we loved living there but it was so big for the two of us that sometimes we felt swallowed up by all of the empty space, consumed by a need to fill that space with “stuff”. Seeing that house again only reinforced our desire to start small this time. We stopped for an early dinner at one of our favorite restaurants in Southlake on or way back to the airport. The weather was sunny and warm and we sat on the patio, enjoying the superb American service – the friendliest, most attentive service that you can get anywhere in the world. We finally arrived at Phoenix’s Sky Harbor Airport around 9pm. Aaron’s mom picked us up and drove us back to her place to reunite with our own little pride and joy – a nine-pound furry angel, named Lena (aliases: Lenasaurus Rex, Little Miss Brownbottom, Poop-a-doo, Little Goodie Four-Paws). Her physical absence from our life made each day on the road bittersweet and it wasn’t any easier on the last day of our trip than it was on the first day. We LOVE our dog! It was a tearful reunion. She was so excited that she was whimpering uncontrollably as she jumped frantically from one of us to the other, smothering us with wet puppy kisses. Her reaction melted our hearts and she has barely left our sides since. As she slowly learns to understand that Momma and Daddy are never leaving her again, we are making up for fourteen months of lost time. We are relieved to find our little furry angel just as we left her. Grandma has spoiled her well. As we gradually reintegrate ourselves into American life, the experiences that we have had over the past year-and-a-half will shape our values and desires as well as the way we view the world. We are fascinated by the international stage and more plugged into world news than ever before. We are more conscientious about being better global citizens. We want to give more and consume less. We want experiences more than things. We want to be travelers in our own country – there are brilliant things to see within our own borders. Most importantly, we want to live every day as if it were our last; to always be mindful of the blessings in our life. We anticipate many challenges and temptations as we plunge back in to American consumerism and many of our former vices may rear their heads once again. We can only hope that every choice will be made with deeper wisdom and worldly understanding of what is really important. Vast and mysterious, rough and raw, with searing cultural intrigue and political history, Russia is endlessly captivating, an appropriate finale to our epic adventure. But Russia almost didn’t happen. It was Aaron’s stubborn determination and the hand of fate that finally saw the Russian visa stickers added to our collection. After failing at our first attempt to secure a Russian visa in Barcelona, my enthusiasm waned when I realized that our next attempt in Rome would cut into an already packed itinerary. But when Aaron fixes his mind to a task or idea, only God Himself can stop him from achieving it, a quality that I find both admirable and maddening. On our first day in Rome, with my fabulously easy-going sister, Natalie, in tow, we spent the better part of two hours just finding the Russian Embassy. Despite our dismissal from the Russian Embassy in Barcelona, we thought our excessively bureaucratic stack of documents to be in order and we found ourselves waiting behind a solid, closed door. We had arrived during the posted visa application hours and had confirmed that we were at the right office, yet the door remained inexplicably closed for over an hour as we sat there, twiddling our thumbs and cursing the bureaucrats under our breath. A couple of people attempted to poke their heads inside the door but were quickly shooed away with no explanation. As the minutes passed, my aggravation festered and Aaron’s patience also began to fade. At 10:50am, we made a pact to tear up our documents right there in the embassy in a dramatic scene of contempt if the door did not open by 11:00. We sat on the cold stone steps, staring at our watches and growing emboldened with each passing minute so that the resolved Charade playing out in my mind was becoming increasingly animated. Then, almost at the buzzer, somewhere between 10:58 and 10:59, a sudden click…and the door opened. Once inside, the agent was surprisingly helpful and expedited the processing of our request using the exact paperwork with which we had been denied in Barcelona. From the first day of our arrival in Saint Petersburg to our last day in Moscow, Russia did not disappoint. Russia has a dizzying number of things to see: beautiful baroque skylines, unique onion-domed cathedrals, fascinating museums, and sober Soviet-era buildings across from modern high-end shopping malls. All corners of Moscow and Saint Petersburg are under constant surveillance by an intimidating number of military and policemen and all corners are connected by one of the most efficient (if not foreign-user-friendly) and utilized public transport systems in the world, which is also heavily policed. While the language barrier proved to be our biggest challenge to traveling independently in Russia, we found that ordinary people would bend over backwards to help us whenever they could. When we found ourselves standing in the wrong ticket line at the train station one morning, the kind gentleman behind us gave up his place in line to take us outside and explain, in very broken English, which way we needed to go. During one of our most confused moments inside the metro station, a middle-aged woman stopped to offer help and guided us through the underground maze to our connecting line. We found that, beneath those characteristically dour expressions, was genuine warmth and caring. Our last week in Moscow concluded with strange happenings that were apropos of our Russian adventures. We had wanted to attend an ice hockey game on one of our last nights in Moscow and, with our host Tanya’s help, conducted our due diligence for securing tickets. We were directed to a yellow kiosk outside one of the metro stations that was supposed to sell tickets but, when we arrived, the women working at the kiosk were clueless. We managed to find our way to the arena where two ticket windows were open. 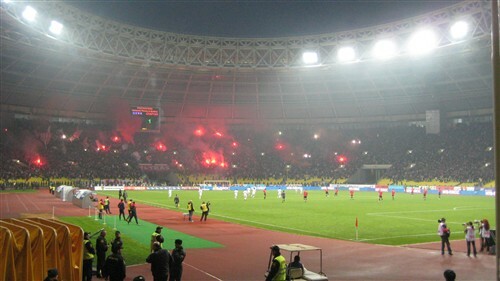 We bought two tickets for Saturday’s game, ecstatic about our accomplishment. When Saturday rolled around, we spent the morning indoors, attending to some business tasks, and then ventured out around 2pm, intending to poke around the nearby university area before heading to the 4:oo game. The university area turned out to be gorgeous with wooded walking trails and a scenic lookout over the city. The weather was beautiful and we walked leisurely along the trail with little regard for reaching the hockey arena before the second period. The arena was a single metro stop away from the university and, when we finally surfaced at the arena stop, we were greeted by hundreds of military and policemen, decked out in full riot gear. We could hear the roaring crowd inside the arena but there was little activity outside and the security forces stood in wait. There were at least six different groups, each with their own uniforms. Naturally, the scene outside and the screams of the hockey fans inside prompted us to conjure up visions of riotous scenarios in which we could find ourselves entangled. We found our entrance, passed through heavy security screening, and entered the arena to find…soccer. When I first glimpsed the green field, I said, “Oh, it’s field hockey.” Then, in a Twilight Zone moment, we walked further inside and realized that it was not hockey at all but rather a professional soccer game between two Muscovite rivals. We looked at each other, dumbfounded, and just started laughing. This hilarious mix-up, on our last night in Moscow, was symbolic of the difficulty of independent travel in Russia. It was as rewarding as it was challenging. 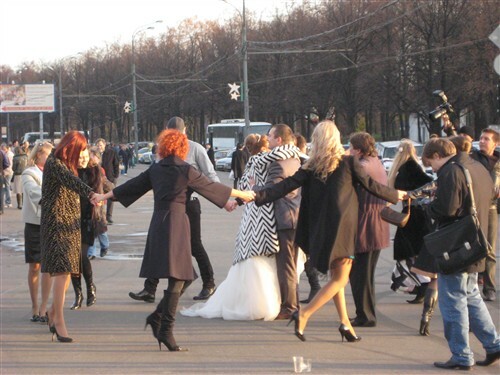 Russia was full of surprises…beautiful, enlightening, funny surprises. The scenery was breathtaking, the culture and history fascinating. 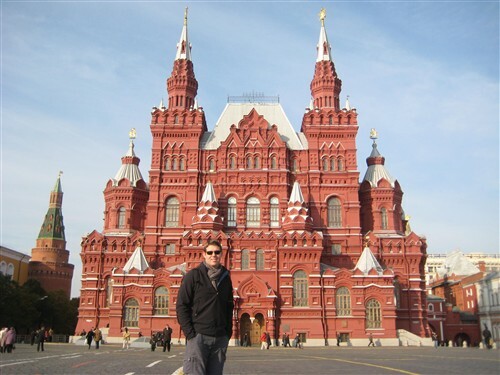 Having already explored our Moscow must-sees, we committed the following two days to some sights further away. 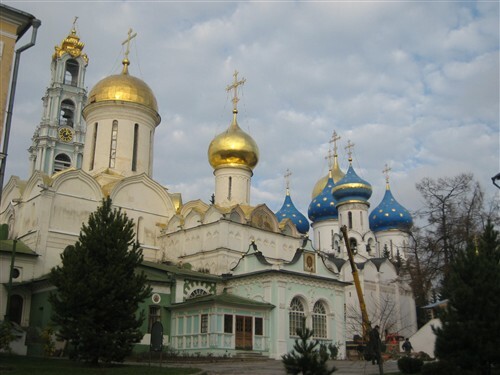 Two monasteries had piqued our interest for their splendor and their proximity to Moscow – Novodevichy, on the outskirts of town, just a short metro ride away, and the Trinity Monastery of St Sergius, located in the nearby town of Sergiev Posad. 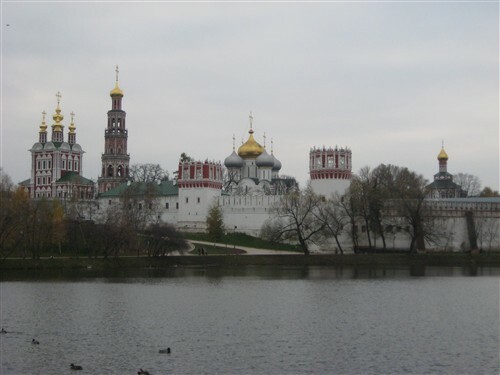 Novodevichy Monastery is located southeast of the city center on the Moscow River. 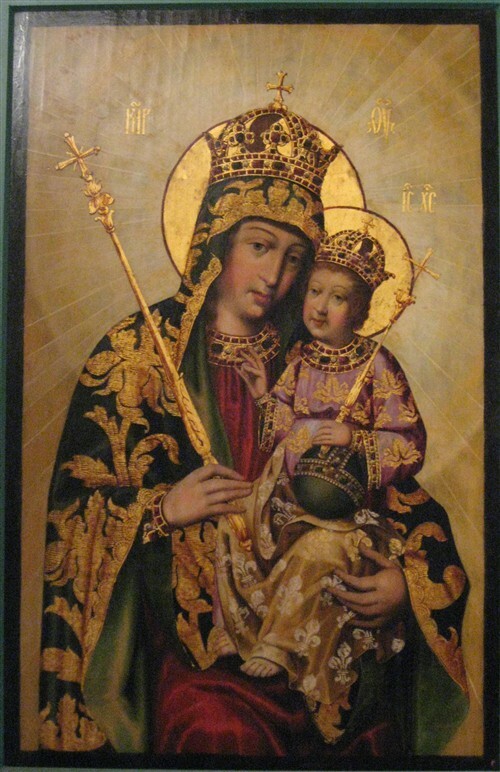 Founded in 1524 to celebrate the retaking of Smolensk from Lithuania, it later served as a strategic watch guard, alerting the city of potential invaders. Today the beautiful white-walled complex with red-and-white baroque turrets, shines brightly against the backdrop of a small suburban lake and park. The obligatory gilded onion domes crown the bell tower and cathedrals housed within the fortress. Before we entered the monastery, we admired the view from afar with a lazy walk around the adjacent lake. With the trees holding on to their last golden leaves and the monastery reflecting on the windswept lake, I was, of course, in photography heaven. The compound is still an operating monastery but the highlights for us were the two special exhibits which displayed the monastery’s impressive collection of Orthodox iconography, art and religious artifacts. There were other notable sights including the Smolensk Cathedral, an imposing bell tower, and the adjacent Novodevichy Cemetery – final resting place for several famous (and infamous) Russians. The next day we traveled to the town of Sergiev Posad, known as Zagorsk during the Soviet era, and a relatively easy 90-minute trip on the suburban “express” (read: painfully slow) train. Securing tickets was challenging (language barriers and poor signage have made arranging all of our transportation in Russia rather difficult) but the destination was worth the effort. Like so many of the Russian Orthodox monuments that we’ve seen, the Trinity Monastery of St Sergius was striking from a distance, dotting the skyline with its signature onion domes. But the monastery is more than a beautiful postcard picture. It is also a pilgrimage destination for scores of Russian Orthodox Christians who come to venerate the tomb of St Sergius, one of Russia’s most revered saints. St Sergius is entombed within the Trinity Cathedral, where a memorial service is performed for him all day, every day. In addition to the Trinity Cathedral, the monastery is home to several brilliant buildings. These include the Assumption Cathedral, adorned with its unique star-spangled royal blue onion domes, and a tall, attractive baroque bell tower. We were disappointed to find that many of the buildings that we wanted to see, including the vestry (where the monastery’s opulent treasury is stored), were closed on the day of our visit. We thoroughly enjoyed our time spent at the monasteries and the metro/train rides added an interesting element of adventure to the days’ exploits. Witnessing a country’s public transport is a true looking glass into its culture. In Russia, millions of people use these services daily, stretching the aging infrastructure to its limits. 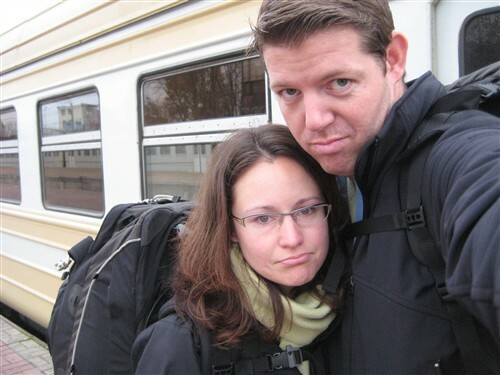 All of our travels in Russia have been aboard the same trains and buses used by the masses. We’ve been crammed into subway stations during rush hour and sandwiched between locals on long suburban train rides. But it’s all part of the fun. There is a saying that I love: “The journey is the destination.” And nowhere is this more true than in Russia. On our second morning in Moscow, we walked back to Red Square for a more thorough exploration of its incredible buildings. First and foremost, we wanted to see Lenin’s body, which is on display inside a large granite mausoleum along the Kremlin wall. No cameras are allowed inside so we had to check our backpack in an adjacent cloakroom. As with most high-traffic areas in Russia, the movement of pedestrian traffic through the mausoleum was tightly controlled. 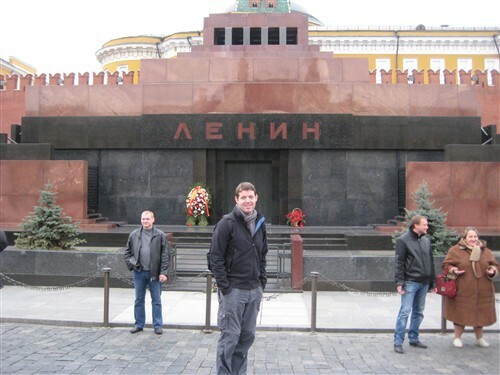 Having passed through security, we followed the crowd along a sidewalk, passing grave markers of other Russian leaders, including Stalin, and meeting more uniformed security at every bend. Intimidation by numbers seems to be the strategy for Russian military and police. You would have to be mad to step out of line under the watchful eyes of so many armed men. Inside the mausoleum, we climbed a short, dark stairway into a dark room. In the center, Lenin’s illuminated corpse glowed like the moon inside a glass case. He wore a dark suit and his legs were covered in red velvet cloth. One hand was clenched in a fist but the other lay flat and I recall that his fingernails looked to be covered in yellowish fungus. We stared, dumbstruck, unable to look away. We were paralyzed with morbid fascination. One of the guards inside urged us forward and we started moving, albeit slowly, around the perimeter. It was a powerful experience. Lenin, who murdered over a million of his own people, abused and starved countless others to push through a social and political agenda that simply doesn’t work, is revered. After Lenin’s death, Stalin had Lenin’s brain removed so that he could study the “perfect Communist brain”. Our minds aflutter with questions about the Communist-era, we made our next stop the State History Museum. We had visited the State Museum of Russian Political History in Saint Petersburg – a schizophrenic collection of artifacts lacking adequate English explanations and logical organization but fascinating nonetheless for those willing to sift through it. I was hoping that the State History Museum in Moscow would fill in the blanks. Russian history has proven to be fascinating but overwhelming, likely due to our lack of background knowledge, though we have scurried to read as much as possible in the past week to bring ourselves up to speed. I wanted to spend a little extra for the English audio guide so as not to miss any important details. We have used audio guides at museums and national tourist sites around the world and all have been rather modern contraptions but not in Russia. In Russia, you get a 1970s cassette tape recorder with two cassette tapes with the sound quality and lack of flexibility that come with such an outdated medium. It was yet another example of how little has been invested in the tourism industry, even in Russia’s flagship city. The content of the State History Museum was different from what I expected. I wanted a better version of the Political History Museum but the State History Museum touched very little on politics. Instead, it focused on Russian culture dating as far back as the Stone Age. Save for a few school classes on field trip, we had the museum almost all to ourselves. Our final stop in Red Square was Saint Basil’s Cathedral. We had photographed its brilliant polychromatic domes from every angle but we had not yet been inside. Commissioned by Ivan the Great (a.k.a. 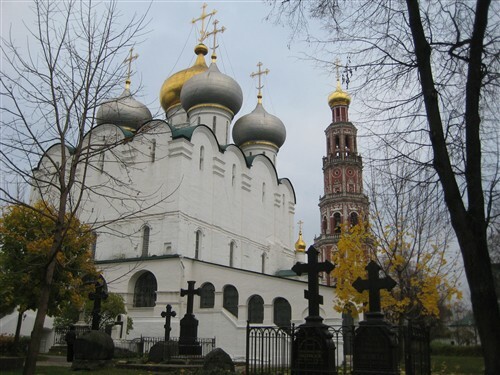 Ivan the Terrible), to commemorate the defeat of the Tatars at Kazan, Saint Basil’s was intended from the start as more of a monument than a church. The story goes that, when the cathedral was completed in 1561, Ivan had his architects blinded to prevent a structure of equal magnificence from ever being built, though other sources dispute the story as little more than a colorful legend. The interior of the cathedral was nothing like we’d expected. It was a maze of cavernous rooms covered in medieval wall paintings featuring flowers and herbs. Access from one level to another was via narrow, dimly-lit passages. The tiny individual chapels were ill-designed for any religious ceremony. 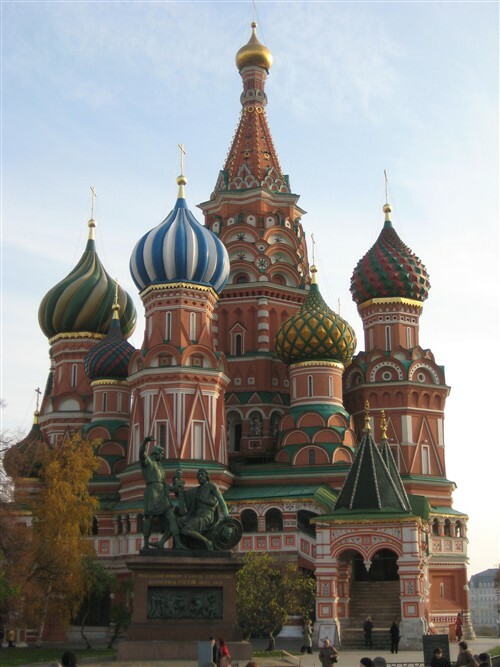 The lack of functionality held true to the patron’s intent that St. Basil’s symbolize war victory rather than anything divine. We came out feeling utterly flabbergasted. We still had a long walk ahead of us and a list of interesting places to see so we quickly recovered and set out for the medieval neighborhood of Kitay Gorod. 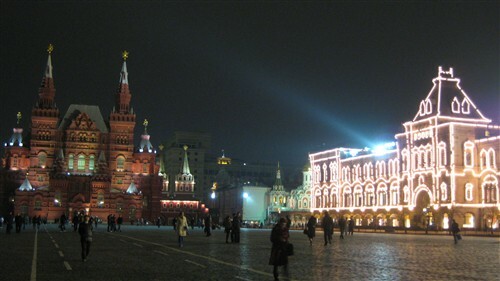 Located just southwest of Red Square, the 13th century neighborhood was the first to be established outside the protection of the Kremlin walls. We walked the streets toward a cluster of smaller but still impressive versions of Russia’s unique onion-domed churches. Not long into our foray, we began to notice a large number of luxury cars parked along the street and several black-clad muscle men lurking about in small groups, eyeing us suspiciously as we walked by. Our instincts told us that we had stumbled upon the Russian mafia and we felt an air of uneasiness but decided that our best course of action was to play the role of ignorant tourists – we were conveniently dressed for the part – snapping excessive photos of the churches without a backward glance. The moment passed without incident, of course, but we won’t soon forget that creepy feeling of brushing up against the mob. 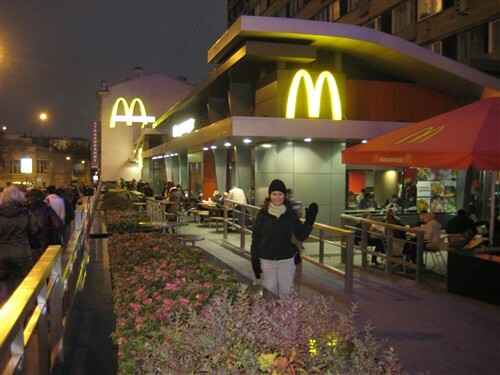 Taking the scenic route “home”, we passed by the Lubyanka Building, the former headquarters of the infamous KGB, which now houses its successor, the Federal Security Bureau; the Museum of Modern Art; and, most importantly, the world’s largest and busiest McDonald’s. With the capacity to accommodate up to 700 Hamburglars, the place was a zoo. After standing in a massive queue, we proceeded to suffer through the most excruciating ordering experience in our broad portfolio of international McDonald’s encounters. Out of 36 countries, Russia has posed the biggest language barrier. We did finally manage to communicate our order and get what we wanted but we left feeling defeated nonetheless. With our epic adventure quickly approaching its end, we are invigorated to finish strong. We are striving to keep our spirits high despite the daily infrastructure and language challenges and absorb every bit of this vibrant and dazzling final destination.